In the Pacific Northwest, the Snake River and its wilderness tributaries were as recently as a half century ago some of the world’s greatest salmon rivers. Now, due to four federal dams, the salmon population has dropped close to extinction. Steven Hawley, journalist and self-proclaimed “river rat,” argues that the best hope for the Snake River lies in dam removal, a solution that pits the power companies and federal authorities against a collection of Indian tribes, farmers, fishermen, and river recreationists. The river’s health, as he demonstrates, is closely connected to local economies, freshwater rights, and energy independence. Challenging the notion of hydropower as a cheap, green source of energy, Hawley depicts the efforts being made on behalf of salmon by a growing army of river warriors. Their message, persistent but disarmingly simple, is that all salmon need is water in their rivers and a clear way home. In the tumultuous summer of 1968, Ed Chaney was witness to a slaughter. Three hundred thousand dead salmon and steelhead were rotting downstream of the just-completed John Day Dam, thirty miles upriver from The Dalles, Oregon, some of the carcasses laid in so thick they looked to him like someone had stacked them like windrows on the beaches. Two years earlier, the Oregon Fish Commission (later the Oregon Fish and Wildlife Commission) had hired Chaney, a rookie fisheries specialist, to work out of its Portland office, where one of his tasks was to report on fish passage issues on the Columbia, including work at the new dams. Frustrated by the censorship, Chaney surreptitiously took a camera and photographed some of the salmon carnage, then took two rolls of undeveloped film to the offices of the Oregonian. “I told their reporter: I’ll give you these on one condition. You didn’t get them from me, and you don’t know who I am or where they came from,’” he explained. “They agreed. Well, I left, thinking, I’ve done all I can do. The next morning, I see another front-page article on the disaster. It says go to such and such a page for photos. So I go there, and there’s a full page of photos and a little box in the center of the page that says, Photos courtesy of Ed Chaney.’ “ The Associated Press picked up the photos, which ran nationwide. His acerbic wit is piqued by a lunch-hour discussion of a long-running BPA public relations campaign. Saving salmon, according to this plan, comes down to the “4 H’s”: habitat, hydro, hatcheries, and harvest. This strategy has been promoted with the same gleeful boosterism found in the bucolic projects of the national farm organization with the same 4-H acronym. Three of the four H’s, according to the BPA’s scheme, should receive the benefit of immediate reform. Habitat lost to logging, mining, agriculture, and development should be repaired. Hatcheries should operate on the frontiers of conservation biology but not sacrifice industrial efficiency. Harvesting should be cut back. Hydropower production, by contrast, should be maintained at current levels at virtually any cost. It’s the hydrosystem’s version of parental tough love for its troubled dependents: plenty of love for the folks, tough luck for the kids. What hydrosystem defenders like to call their “spread the risk” philosophy is fraught with potential pitfalls for fish but contains quite tangible benefits for dams. 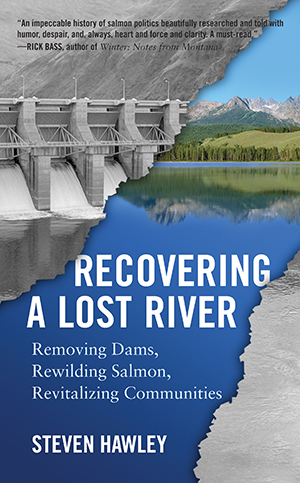 Under the guise of this holistic-sounding approach to restoring salmon, solutions to the problems that dams alone have created for salmon can be neatly deflected onto tributaries, estuaries, the ocean, fishermen, global warming, or the host of salmon predators that hunt the river. Chaney contends there is a fifth H.
Chaney may be angry as a cut snake, but he’s accurate as a scientist. According to recent numbers, gleaned from an interagency, decade-long endeavor dubbed the Comparative Survival Study, a very conservative estimate for current overall salmon mortality due to the hydrosystem in any given year would be half the population. A 1994 Ninth Circuit court decision assigned the blame attributable to dams for that overall decline at 80 percent. Chaney pointed out that all other stakeholders in the Columbia--from grubby gillnetters working the estuary in Cathlamet, Washington, to the spey-rod swinging yuppies in a riffle on the Clearwater, in Idaho--were left to fight among themselves for their share of the remainder. And that amid this squabbling, Chaney said, too little attention has been paid to a last-ditch salmon barging experiment the federal family has since upheld for three decades as a viable restoration plan.